Christians on the left and the right argue that more believers should attack today’s social ills. 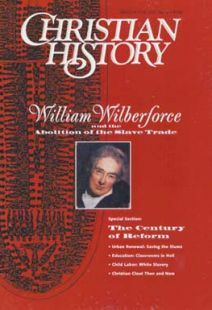 They often point to William Wilberforce and other 19th-century British evangelicals as examples to imitate. So how relevant are these examples today? To answer that question, Christian History editor Mark Galli interviewed John Wolffe, senior lecturer in religious studies at The Open University in Britain. John edited Evangelical Faith and Public Zeal: Evangelicals and Society in Britain, 1780–1980 (SPCK, 1995). What rationale did British evangelicals give for getting involved in social reform? First, there was the view associated with Lord Shaftesbury: social reform is a preparation for people’s hearing the gospel. The preaching of the gospel is absolutely vital, but if people live below a certain level of human dignity or material comfort, they may not respond to the message. If people work 12 or more hours a day, six days a week, they’re not likely to go to church on Sunday. They’re going to stay in bed trying to recuperate. Were postmillennialists—who believe Christ will establish his kingdom after the world has been substantially improved—more likely to get involved in social action than were premillennialists? Yes, broadly speaking, with a few striking exceptions. For example, Shaftesbury was a premillennialist. He was pessimistic about human potential. He believed that a direct and spectacular divine intervention of Christ at his Second Coming is necessary to save the world. But he also believed that intervention by the state through law was necessary to save people from the worst excesses of early industrialism. The world was vulnerable and under divine judgment. The Second Coming, which Shaftesbury felt was imminent, was a spur to swift action. But Shaftesbury is untypical. The more common premillennialist view was that preaching the gospel should take priority, and nothing else ultimately matters. Did evangelicals tend to join one political party over another? Especially on the issue of slavery, there was a great deal of bipartisan effort. The main issue was not whether you were a Tory or Whig (the two major political parties). Party membership was fluid then, and both parties were essentially aristocratic cliques. The real issue for many in those years was whether you were anti-slavery. It wasn’t until the 1830s that Anglican evangelicals, for a number of reasons, moved toward the Conservative Party (formerly Tory). Did uncompromising idealism gain evangelicals their political victories? Or did they compromise some ideals to achieve progress? Some compromise was necessary. Shaftesbury went through anguish about this, but he soon learned to modify his agenda so he could achieve some of it. For example, he really wanted to limit the number of daily working hours in factories to ten but agreed to a ten-and-a-half-hour work day to at least make some progress on the issue. Evangelicals were divided on slavery. Some believed, as did many Christians in the American South, that slavery was justified biblically. Even those who believed slavery immoral disagreed on how best to eradicate it: immediately or gradually? By force of law, persuasion, or military might? Another issue was education. Beginning in the late 1820s, more and more Nonconformist evangelicals began taking prominent roles in national affairs. They shared with Anglicans a passionate concern for education; both groups saw it as a means of spreading the gospel. But Nonconformists were not ready to pass legislation that favored the teaching of Anglican doctrine or giving privileges to Anglicans. These divisions ended up frustrating efforts to retain Christian teaching as a prominent part of public education. That led ultimately to a loss of control over the educational system, opening the way for a more secular state education. In what social or political areas did evangelicals score their greatest success? A great deal can be said for the national legislation enacted, but in many ways, the most significant social transformations in 19th-century Britain occurred at the level of the local parish. In the late 1700s and early 1800s, popular revivalism led by the Methodists helped transform communities that had been largely unchurched. They were given a spiritual focus, which generated social structures such as the small-group-like “methodist societies” where people supported each other in practical ways. Out of that grew the concern for education and other social services across communities. Also, take the ministry of Thomas Chalmers in the 1810s and 1820s in Glasgow, Scotland, as an example. He thought of the parish as a self-help unit. You inspire people to take their Christian social responsibility seriously and then you set up structures to help them fulfill that responsibility. Coupled with his evangelistic teachings, he advocated an intensive program of education and social help at the local level. Did evangelicals make any significant blunders? So the country became polarized, and evangelicals ended up with a tarnished image. Why did evangelical social passion wane at the end of the 1800s? It didn’t wane completely; it was still there, especially at the grassroots level. But at the national level, a number of factors conspired to cool evangelical social passion. First, the success of evangelicals. Many of the pressing needs of the early 1800s had been alleviated. Shaftesbury in later life spent more time on animal welfare. The fact that cruelty to animals came to the top of his agenda suggests, at least in part, that to him many critical needs of people had been met. Second, much of the Christian impetus for social reform was channeled into the Labor Party and trade union movement. By the end of the century, many social causes were championed by non-evangelicals. Third, the political system became less responsive. It was much harder to build a consensus across party lines, as Wilberforce had done on antislavery 50 years earlier. When party politics thwarted worthy social programs, many evangelicals became disillusioned and retreated from the political arena. Finally, there was a spiritual/theological dynamic. The Keswick movement, which became popular among evangelicals, encouraged people to cultivate a personal walk with God and to strive for personal holiness. The result, naturally, was that social reform took a back seat. Many American evangelicals, like Charles Colson, lift up Wilberforce and other 19th-century British evangelicals as examples to emulate politically today. Is that a fair use of history? It is to this extent: 19th-century evangelicals, when they saw a problem, believed they could do something about it. They knew they weren’t going to get instant success, but they had a sense of divine calling to address the problem. In the contemporary world, I sense more defeatism; problems are just too big. But these British evangelicals teach us that individuals with vision and leadership skills can respond to the call of God and make a difference. But we shouldn’t underestimate the vastly greater scale and complexity of late—20th-century societies and their problems. A 19th-century Wilberforce could quickly stimulate nationwide petitions and public meetings, and all within a culture that claimed to share Christian values. A modern-day Wilberforce needs to be much more sophisticated. He or she obviously would need to learn how to make use of the media; he would need considerable financial resources; he would need to communicate with all sorts of interest groups—and all in a culture with a secular mindset. So the challenge is much more complex. Then again the opportunities are larger. What could Wilberforce have accomplished if he had been able to use television? What personal lesson do you garner from this era? The need for patience, for sticking at something to see change, to see God work in a situation. Shaftesbury, for example, took up factory reform in 1833. It was only in 1847 that his objective, the ten-hour work day, was achieved. He committed himself to a 14-year struggle that at the onset he hoped would take 14 weeks. John Wolffe, senior lecturer in religious studies at The Open University in Britain. John edited Evangelical Faith and Public Zeal: Evangelicals and Society in Britain, 1780–1980 (SPCK, 1995). For centuries Christians East and West lived as strangers to one another. Then Catholics violated the Orthodox.